All information on this page was collected and researched by David White. Please ask permission to use it should you want to. 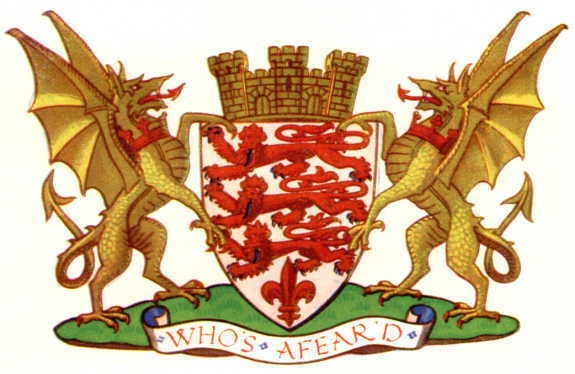 Note also, that red, white and gold can be found in the arms of Christchurch Borough Council, the former East Dorset and Wimborne District Council and to some degree, West Dorset District Council. Dorset Fire and Rescue Service also uses these colours in their arms. The exact colours are red (pantone 186), gold (pantone 116) and white. Red and white, as in the DCC arms above also fittingly remind us that we are a proud English county. From a historical perspective, gold is representative of Wessex, the ancient Saxon Kingdom that Dorset was once at the heart of. Wessex is thought to have been represented by a Golden Dragon (as seen above). Harold II, the last Saxon king famously defeated by WIlliam had the Golden Dragon banner flying when he fell at Hastings. Before you say it – I know what you’re thinking – wasn’t it a Wyvern?…..ah, but, back in those days – there was no distinction between Dragons and Wyverns as there is today. They were all called Wyrms. 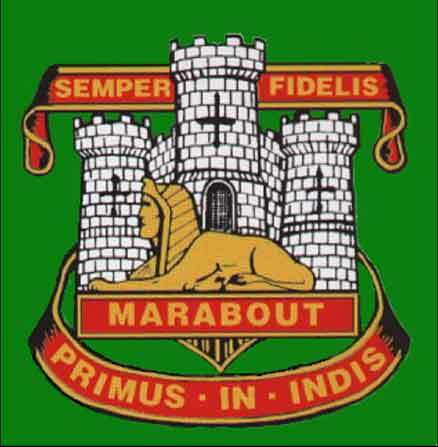 The original Dorsetshire regiment used colours as shown below to the left; with the later Devon and Dorsets to the right. Most prominent is the golden wreath, but note there was no green used. With the merger of the two regiments, this wreath was removed, but green and gold became their technical recognition flash. Gold continued to be used in the new insignia (below, right) with cap badges using gold instead of red. From this we gather that green arrived with Devon and gold was representative of Dorset. Note the golden ‘wreath’ of the original Dorsetshire regiment. Devonshire introduced the green and removed the wreath. Another connection to the Dorsetshire regiment is in the uniform that was worn when the militia was raised to fight off the Duke of Monmouth’s uprising in 1685. The militia wore red coats with yellow facings. The drummers actually had this reversed with yellow coats and red facings. Gold represents Dorset’s agriculture; the rapeseed fields sporadically all start popping up around Spring. In the midst of summer, the worked grain fields come to maturity. Golden Cap is the name of the highest point on our world-famous Jurassic Coast. Gold Hill in northern Shaftesbury has featured in much advertising and is another nationally recognised area. We call it the Dorset Cross. You may have seen us previously refer to it as St Wite’s Cross. After listening to some feedback, we felt a more encompassing, secular name would be better for the flag and the people it represents. One of our principles states that: “Everyone is free to interpret the use of the cross on the flag in his or her own way.”. This doesn’t mean we are abandoning St Wite, far from it, see below. The flag belongs to Dorset, so it’s the Dorset Cross. Imagine a line that reaches from Portland to Gillingham and then Lyme Regis to Christchurch. If the Dorset flag was to be named after a saint, like St Piran’s flag in Cornwell and St. Petroc’s in Devon, our choice should fall on Saint Wite, Dorset’s own saint above all others. 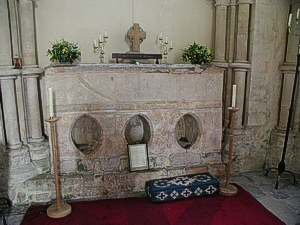 The church at Whitchurch Canonicorum, a small village in West Dorset, contains her remains. Apart from those of Saint Edward the Confessor in Westminster Abbey, these are the only relics of an ancient saint in the whole of England to survive the reformation and remain in their traditional setting. St. Wite is therefore a symbol for all that is unchanging and unmoved in the Dorset landscape, a symbol for the down-to-earth people of Dorset and the Dorset identity. Various suggestions have been made in recent times about the identity of St. Wite. One can read about these in Christine Waters’ booklet “Who was St. Wite?” The relics themselves however show that she was a woman of about forty years of age, and the mediaeval church was quite firm about her being a martyr. Two hypotheses that have received undue attention in the past can therefore be ruled out without further consideration. What it comes down to is that local tradition is likely to be correct, and that St. Wite was a Saxon holy woman, martyred by invading Danes during the ninth century: possibly an anchoress, a female hermit who spent her time in prayer and in caring for the local community. We know that in the Middle Ages pilgrims came to Whitchurch in large numbers to honour St. Wite and ask for her help. There are other saints associated with Dorset, such as St. Cuthburga, an Abbess of Wimborne who was related to the Wessex royal family, and St. Aldhelm, a scholar and erstwhile Bishop of Sherborne who finished his life as abbot of Malmesbury in Wiltshire. These are important saints of Wessex but they lack St. Wite’s intimate and humble connection with the ordinary people of the county.